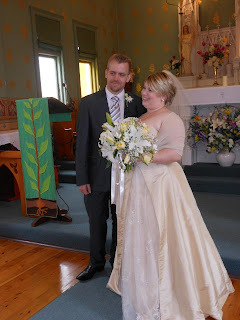 I knew soon after Graham proposed to me in October, 2010, that I wanted to get married in my home state of New South Wales, in the little village church of St Michaels in Mittagong. Perhaps this was silly. I have written before about my ridiculous lack of organisational skills. How was I meant to organise a wedding from across the country? 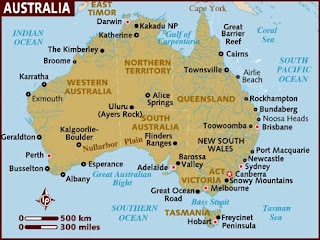 I live in Perth, WA, and that is a huge distance away from NSW. 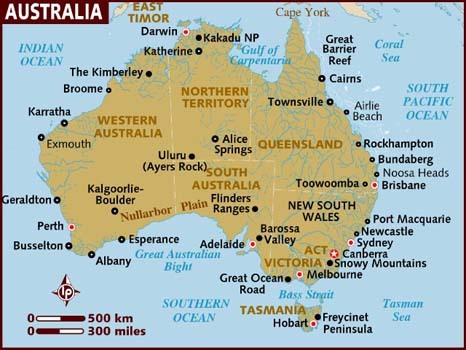 It is a 5 hour flight from Perth to Sydney, or a week's drive across a desert. For my international readers, that's the equivalent to flying from London to Greece, or from New York to the Caribbean! I would have to organise everything long distance, as well as organise flights and luggage for myself, my husband, his groomsmen, and his family. How on earth was I to manage? I quickly found myself bogged down in tasks. Wedding dress shopping, invitations, guest lists, reception venues, catering, booking the church, bridesmaids' and groomsmens' attire... the list seemed endless. Faced by a gargantuan collection of jobs, I felt like cancelling the whole thing. It all seemed too hard, and too expensive. Who on earth has the money to pay for a wedding these days anyway? With the average wedding costing around $30,000 Australian, I knew I couldn't afford the sort of wedding presented as "essential" in all the wedding magazines. Apparently you need professional photographers and cameramen, rented wedding cars, professional hair and make-up artists, DJ's... the list seemed endless. Even if I had the money to pay for all of them, how would I ever coordinate them all? The answer came in the form of family and friends. When I confessed to my mother and some close friends that I was overwhelmed, they stepped in and helped in so many ways. Firstly, they helped me understand what was necessary, and what could be safely dropped. The most important thing was to get the ceremony right. 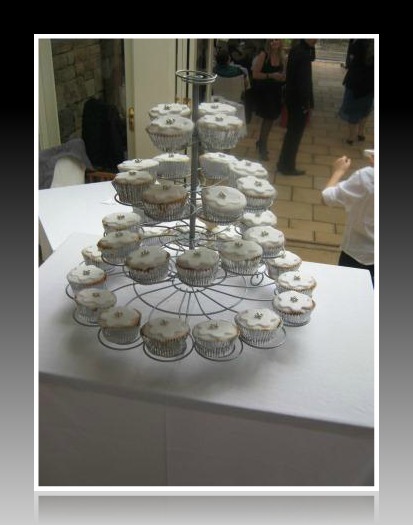 Then the reception needed to be organised. And then flights and accommodation. All else could be dispensed with or left to others to do. And the amount of help I got from other was amazing! Julie, my good friend in Perth, gave up 4 or 5 afternoons to help me create gorgeous hand-made invitations and mass booklets. I paid only for the basic materials, and ended up with gorgeous professional-looking invitations. She helped me make sense of the ceremony, and was a great source of support and advice from her own lovely, low-budget wedding. Many days when I would have rather forgotten about the whole thing, Julie made me feel like I could manage. 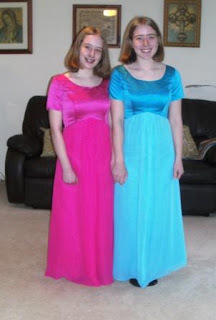 My mum found the site my bridesmaids could get their dresses from (especially helpful when they lived in three separate states!). On my sisters' request, I selected a short sleeved, high-waisted style of dress. Each bridesmaid got one made in her own measurements and in the colour she liked best, so that I could have a rainbow of bridesmaids. 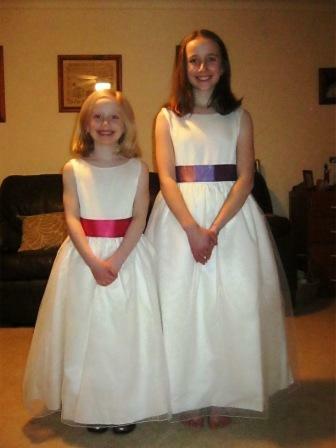 My mum then found two darling flowergirl dresses in white with bright sashes for my younger sisters. My sister Imogen made my wedding cake - a beautiful cupcake stack decorated with white edible flowers. She also volunteered her exquisite singing voice, and sang the Panis Angelicus and Ave Maria solo during the ceremony. My brother Callum cleaned and organised his car, and acted as my chauffeur for the wedding day. An old friend offered to pay for and arrange my wedding flowers. Mrs H. took me down to the flower markets in Sydney the day before the wedding and allowed me to pick out the flowers I wanted. I ended up with a gorgeous bouquet of white tulips, roses and lilies, while the bridesmaids and flowergirls got bouquets of multi-coloured tea-roses. She even squeezed her supply of flowers far enough for button-holes for all the men, and corsages for my mum and Graham's mum! My friend Francis generously agreed to take my wedding photos, and brought, not just his professional camera, but a colleague to help. Another friend, Joshua, brought his guitar all the way from Adelaide, and played and sang at the ceremony. 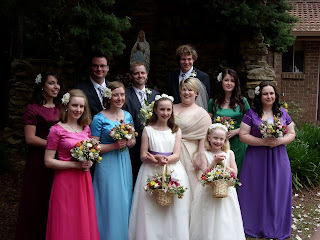 And so many people put aside their time and made the huge effort to get to the wedding, especially my two bridesmaids from Melbourne, the groomsmen from Perth, and my maid-of-honour from Albury. I could go on describing the gifts of time, effort, money and support we received, but I think you understand just how much help I received. After all this, my own efforts seemed insignificant - as if, knowing I didn't have the skills necessary for organising our wedding on my own, my family and friends decided to do most of it for me. I guess this is a "thank you" post. If you read this and see your name here, or even if you helped me and I haven't acknowledged you by name, please know how grateful I am. 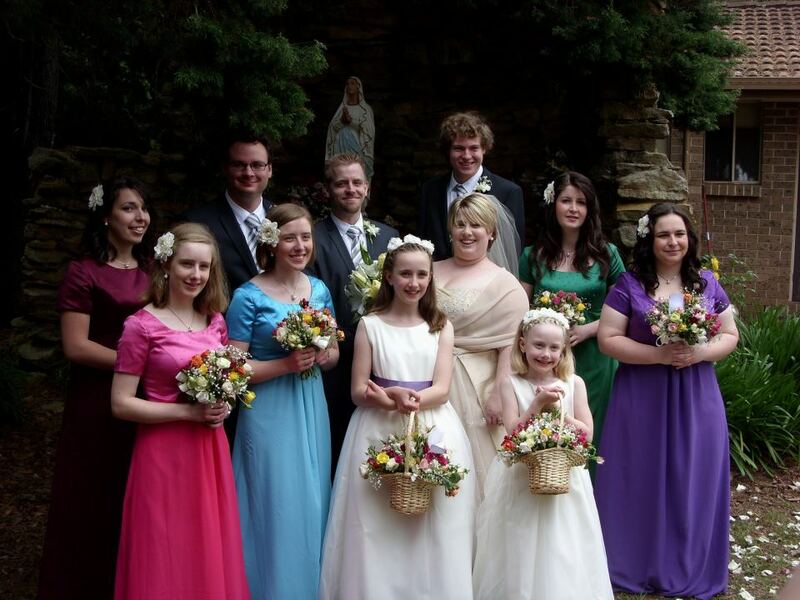 What seemed like such a mammoth effort became a work of love, as so many people made sure our wedding day was special. I am glad we didn't have the money to afford a "normal" wedding. How could a wedding organised by distant professionals and paid for out of a large bank balance ever be as intimate and special as our little wedding? It may not have felt like a "professional" event, but it felt better - a celebration with those people who love us best. I love you all so much, and I look forward to when I can next celebrate with you. I was so grateful Fr Sean offered us the church free of charge. He said he knows how expensive weddings are, especially for big families. Oh yes!... The Pauline Fathers wouldn't accept any money either. Father Damien was wonderful, wasn't he?